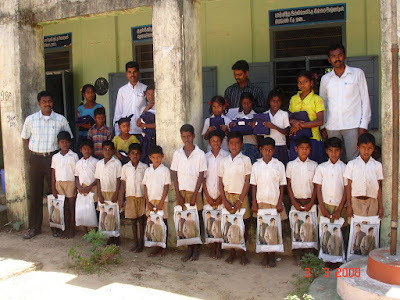 GOVT MIDDLE SCHOOL, MATHOOR, TAMIL NADU – UNIFORM PROJECT DONE. As we planned, I visited MATHOOR GOVT SCHOOL on 3rd March 2008 (Monday) to distribute school uniform for poor students. I apologize for not sending the report immediately. We had asked 2 tailors to make 2 sets of school uniform for 21 students and they made it for 22 students. I didn’t want to disapport other students without gifting anything. I discussed with school teachers and we reached school with 22 sets of school uniforms, 29 slates, 120 pens and some pencil-rubbers for remaining students. Headmaster was on medical leave and came to school for this occasion specially. 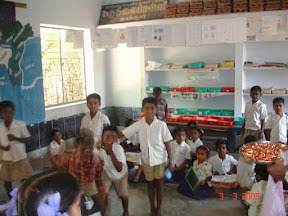 After small introduction about India Sudar and our activities, i had asked my father to distribute uniforms to all 22 students (2 were absent on that day) and then distrubited slates, pen, pencils and chocolates. 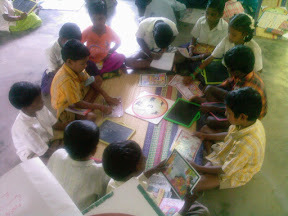 I could see the happiness of those students, it was like diwali for them :-). Few students brought their mother and i had small chat with them. They are very poor people and they are not able to buy a new uniform. At the same time, few students asked me directly why we haven’t considered them. Finally, It was a wonderful day for me, teachers, headmaster and the students as well. My local friends, brother and my father helped to make all the arrangements including school uniform and other stationaries, thanks a lot to them. Our heartly thanks a lot to DREAM INDIA 2020, JAYASREE JAYAPRKASH, ARCHANA, BALAJI AND NANDHINI to make this project happens. Without them, we would not have executed this project within 2 weeks. This must be third mail about GOVT MIDDLE SCHOOL, at MATHOOR, Tamil Nadu. I forgot to mention about an interesting student Sakaravarthy S/o Mr.Arumugam. He is dumb and deaf and studying 8th Standard in that school. The Teachers are not very sure about how to communicate with him, but he learns lessions from his classmates and teachers through signs and lip reading. He is one among the bright student in his class. His handwriting is really neat and beautiful. He would come out of that middle school in this year, and we have to find a right school (special school for dumb and deaf) in Tamil Nadu and help him to continue his education. Chennai team – Can you please help him to identify a right school for him. Please call me to know more details about him. I have contacted a local tailor near to Mathoor village and enquired about the cloth required per student and tailoring charges. Based on the conversation, i have given the estimate for every student in the below list (same excel sheet is attached here). We need around Rs. 6000 to provide 1 set of UNIFORM to every student. I guess, it would be better to give 2 set for every student. As I mentioned, they don’t have any other dress i guess. Please let me know, if any of you willing to contribute for those students or if you need any other information. I visited GOVT MIDDLE SCHOOL, MATHOOR VILLAGE on last Monday. 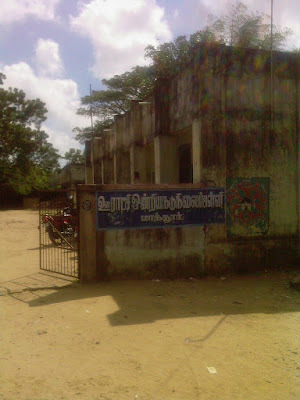 Mathoor village comes under Nagappattinam District, Tharangambai taluk. It is kind of remote village and surrounded by paddy fields. Thanks to teacher Miss. Sumathi to bring the information and requirements about this school to our notice. In this school, there are 211 students studying (106 boys + 105 girls) from 1st to 8th standard with 6 teachers including Headmaster. There are many dropouts in that village due to poverty. I had visited all the classes from 1st standard to 8th standard, i could see about 20 students wore very old and torn clothes. Teachers told me that those poor students have only 1 set of dress and they wear the same everyday. It is really bad to see those students wearing shirt without even buttons and they adjusted with safety pins. Looks like it is very common there, but it is very bad to see those students. I have collected the name of 20 students, who requires at least 2 pairs of school uniform immediately. We don’t need to wait till next academic year. All the students are sitting on the floor and attending classs. I guess, it is very common in most of the village schools. Based on my discussions with school teachers, we can provide sleeping MATS, that would give little comfort for those students. I think that would cost Rs.100 and if we are able to give 20 sleeping mats, that is very sufficient. They also told us that toilet is in very bad shape, but i told them it is least priority compared to poor students not having proper clothes. The important requirements is – they need 1 or 2 teachers to cover 8 classes. 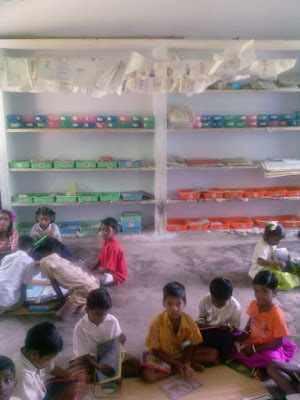 It is very diffucult for students as well as teachers to manage 8 classes with 5 teachers and 1 headmaster. I got this information one day prior to visiting this school and i came across a deserved candidate near to that school, her name is Miss. S Suganthi and she had completed M.Phil. I had discussed with her and her family about the job opportunity at this school and INDIA SUDAR. They agreed to work in that school for Rs. 2000 per month. Since i knew the requirement in that school already, I went to school along with Miss. S Suganthi and discussed with Headmaster Mr. Kaliya perumal and other teachers Mr. Raghunath and Miss. Sumathi. They all agreed and happy to get another teacher for their school. Miss. 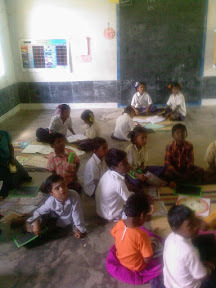 Suganthi is continuing as a teacher in that school from last Monday (11th Feb 2008) and deployed by INDIA SUDAR. We have decided to visit this school before this month end and distribute school uniforms for those 20 students, agreement to deploy teacher and handover the salary cheque to Headmaster. 1. Miss. 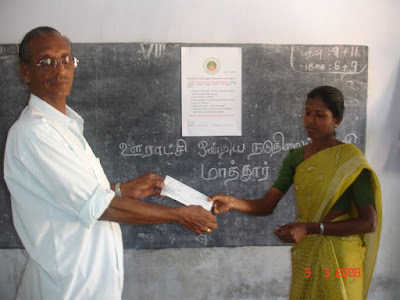 Suganthi, M.Phil is working as teacher since 11th Feb 2008, deployed by INDIA SUDAR. We agreed to pay Rs. 2000 per month. 2. We are looking for sponsors to pay this salary and buy school uniforms for those 20 poor students. After the Mathoor’s school visit, i visited GOVT HIGHER SECONDARY SCHOOL, AKKUR. I had a long discussion with Headmaster.